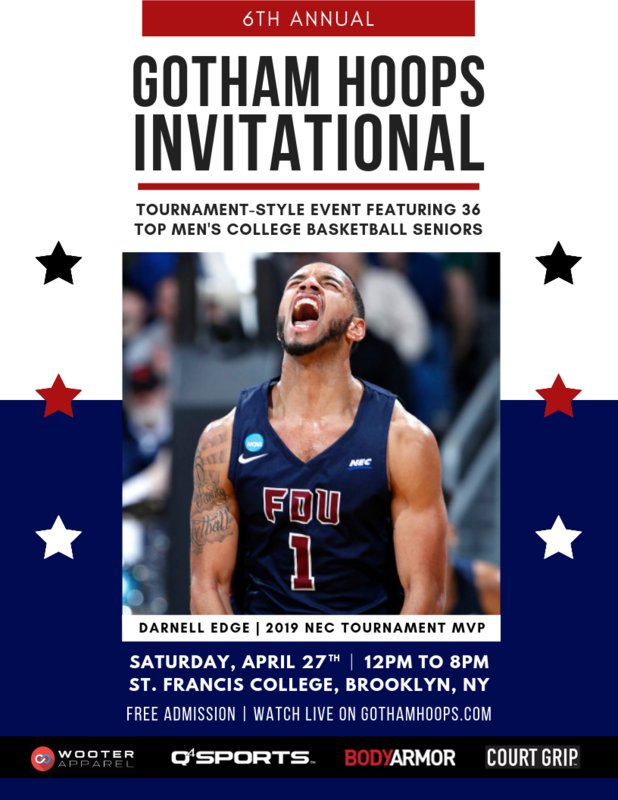 Brooklyn, New York – The 6th Annual Gotham Hoops Invitational is scheduled for Saturday, April 27th at St. Francis College. This tournament-style event features 36 top men’s college basketball seniors. The 2019 Gotham Hoops Invitational tips-off at 12:00 PM with semi-final games followed by consolation and championship match-ups at 4:00 PM and 6:00 PM, respectively. Participants in this year’s showcase include Darnell Edge (2019 Northeast Conference Tournament MVP) and Mike Holloway Jr. (All-NEC Second Team) of Fairleigh Dickinson, Hofstra’s Jacquil Taylor (All-CAA Defensive Team) and Curtis Jenkins (3x ECC Defensive POY) of Molloy, among others. Admission is free for all spectators. Games will broadcast live on GothamHoops.com.